Google updater is introduce by Google , is an amazing and wonderful application that comes with Google Pack software. Google Updater application automatically installed or downloads, during installation of any software from the Google Pack. Google Updater helps and guides the users to the whole installation process. Google Updater works like Download Manager. 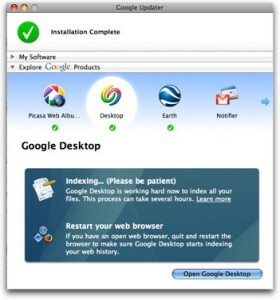 The Google Updater application monitors the installation process and gives update about the installation of software progress that includes which software is installed and uninstalled from the computer. Google updater tray notify the users with the latest and update version of the Google pack softwares and it helps in installation of the software, and also automatically update the programs. Google Updater is highly recommended by Google in order to install applications , as Google updater helps in easy installations of Google Pack softwares and automatically up to date the Google Applications. Download Google Updater for free right from here.